I have been dancing this week, but not on my feet. It’s been more of a mental minuet, a pleasant TAH-ta-ta-TAH (glide), TAH-ta-ta-TAH (dip) that has accompanied me on my daily rounds of work, kids, life and given my mundane tasks a little pick-me-up — or a tirami su in Italian (it’s more than just a dessert!). Sometimes the tune expands to a waltz, occasionally a cha-cha, and once I even boogied, but mostly it’s an elegant float across the floor without a lot of showy grand jetés. to the apology poems in This Is Just to Say: Poems of Apology and Forgiveness , modeled on the poem by William Carlos Williams, there’s always some new tune to hear. Like this one. It’s a riddle and a song! So there I was, dancing in my head…until I got to this gem from Song of the Water Boatman and Other Pond Poems. Go ahead, click on it. Sing it. I’ll wait. See what I mean? Clearly I could not read “Listen for Me” and not break out my feather-trimmed gown and long gloves. The lyricism, the repetition, the build of each stanza, the rhythm created by the form itself — GAH! I’m not sure if he’s singing a foxtrot or a rumba, but that frog had me at ribbit. It’s not hard to see why this book is not only a Caldecott Honor Book, but also the winner of the Lee Bennett Hopkins Poetry Award. “As we are now, so we shall be…” I’m pretty sure Joyce’s poetry will be as enduring as the creatures in this book and that she’ll be making kids dance for a long, long time. Especially if they have “The Ants” in their pants! Joyce: who are you, where are you, and how long have you been a rhyming fool? I’m a homebody with an overactive dog living in Minnesota (where it is currently snowing, on April 21). Been writing all my life, and I used to draw a lot, too. I began to gravitate toward poetry in high school, and towards children’s lit after having kids and reading them all those rich, delightful books. Uhhhhh . . . the first one I remember writing (in fourth grade) was embarrassingly bad. It was about snow–and I didn’t even live in Minnesota at that time. I had noticed that fallen snow sparkled in the sun, which seemed magical to me, so I had to write about it. That’s pretty much been my pattern ever since. “The Ants” is part of your collection Ubiquitous, which is all about why and how certain life forms survive. Most of your other books of verse also deal with the natural world or other non-fiction topics. What draws you to these themes? Do you have a background in science? We write about what we find beautiful or inspiring or mysterious. The natural world is all those things to me, so that is often what I focus on. I don’t have a science background per se (beyond college courses), but I love to ask questions: What makes a species survive? How do creatures make their way at night? Why do spirals appear so often in nature? I start with something that intrigues me. Then I explore it–find the most interesting parts–and create poems around them. A book takes me anywhere from a few months to several years to complete, depending how focused I am on the topic. If I’m not sure of my way, I put the poems aside and come back to them, hoping for clarity. What kind of preparation goes into the writing of your collections? I read a lot. I walk a lot, and think a lot. In order to go forward with a poem, or a collection of poems, I have to discover its voice–a glimmering of the tone, the structure, or the mood. Once I envision that, I can proceed, but I do it cautiously. I am not prolific–I don’t write reams and toss most of it. I do a lot of sorting and evaluating in my head, and only put words down on paper when I’m fairly certain the project is working. I read in an interview that you came relatively late to (or “happened upon”) writing poetry for children. And yet in the few years since the publication of your first collection, Just Us Two: Poems about Animal Dads, in 2000, you have earned multiple major awards and recognition for your work. That pretty much equates to overnight success in the publishing world! What has this journey to publication and beyond been like for you? Where do you hope to go from here? Have to chuckle at that “overnight” remark. I have been writing all my life, and my first book wasn’t published until I was in my 40s. Not exactly overnight! I think it just took me a while to find my voice. Even after I started to pursue children’s literature, it took me ten years to get a book accepted. The middle grade novels and picture books I submitted again and again never found homes. It wasn’t until I began combining an old love (poetry) with a new love (children’s books) that I got a toehold. 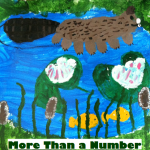 One day I read in my SCBWI newsletter that Millbrook Press was looking for literary works that could be used in the classroom, and I sent in a poetry manuscript about animal fathers (Just Us Two), which was accepted. Millbrook also published my book Eureka! Poems about Inventors before they went into bankruptcy and reorganization. Eventually I had a third poetry manuscript accepted by Ann Rider at Houghton Mifflin (who had seen and turned down dozens of my manuscripts), and I’ve been working with her ever since. Houghton does a beautiful job with my books, which has contributed to the attention they have received. Hopes for the future? Keep finding good ideas. Keep writing. Do you have formal training in poetry and/or did you have a mentor? How did this shape your writing? 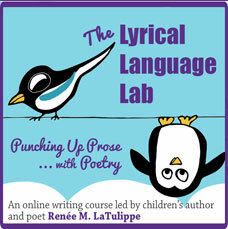 Do you think mentoring is important for new children’s poets? I think everyone comes to poetry (and writing) differently. I had wonderful, encouraging teachers in high school and college (including former poet laureate Richard Wilbur), and heard lots of visiting poets that made me fall in love with poetry. I’ve been reading it avidly ever since. Maybe I could say that poetry itself is my mentor? When I discovered children’s poetry, Alice Schertle’s work blew me away–especially Advice for a Frog. I wanted to write a book like that. Or one like Kristine O’Connell George’s Old Elm Speaks: Tree Poems . Good poetry thrills me and makes me want to write. As for new writers, I think everyone benefits from writing colleagues that challenge them to work and rework their manuscripts–I’d be lost without my writer’s group. But you want to develop your own voice. So find people you trust, who won’t say, “No, you can’t do it that way.” Believe in your own unique voice. Same criteria as an adult poem: it must affect me intellectually, emotionally, and viscerally–a “wow” moment I feel in my gut. Advice to budding poets: read a lot of poetry. Try to figure out what speaks to you and why. Then start writing. Is there anything you know now that you wish someone had told you when you were just starting out? Actually, a fellow writer did tell tell me something important early on, and I have been so glad of it over the years. Her advice was: always focus the work. That is the most important thing. Not publication parties, not sales figures, not contracts. The work itself, and the joy that comes along with it. As a teacher yourself, what advice would you give to teachers who may be reluctant or insecure about sharing poetry with their students? Go to a public library and ask for the children’s librarian. 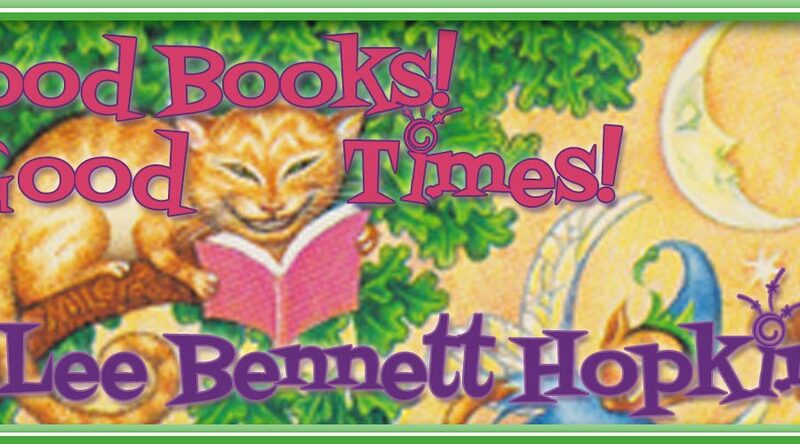 Ask her/him to hand you a sampling of the best books of children’s poetry out there. Then read them. Find a few poems you like. Share THOSE with your students. Figure out TOGETHER why they’re so good. Your students will catch your enthusiasm! Then, write some poetry with them–they will love it. You can use the ideas on my site here. If you could go on safari with any children’s poet (living or otherwise), who would it be and why, and what would the two of you do while rattling around in the jeep? It would be Marilyn Singer, since we are friends but never have any time together. She’d be someone who would stop the jeep at the drop of a hat and inspect any interesting plant or creature with me. Then we could write a book together about everything we find! Can we come visit you and peruse your wares? Yes! Please come visit! There are book trailers, classroom guides, videos of poetry reading, and photos of my dog. And don’t miss my Robin Journal, a journal of the year robins nested on my porch. Thanks for stopping by, Joyce, and for adding “The Ants” to No Water River’s growing video poetry library! See a list of all of Joyce’s books. Click on the book covers to find reading guides and to learn more about the history and awards for each book. Peruse Joyce’s pep talk and links for writers. Invite Joyce for a Skype visit to your school! 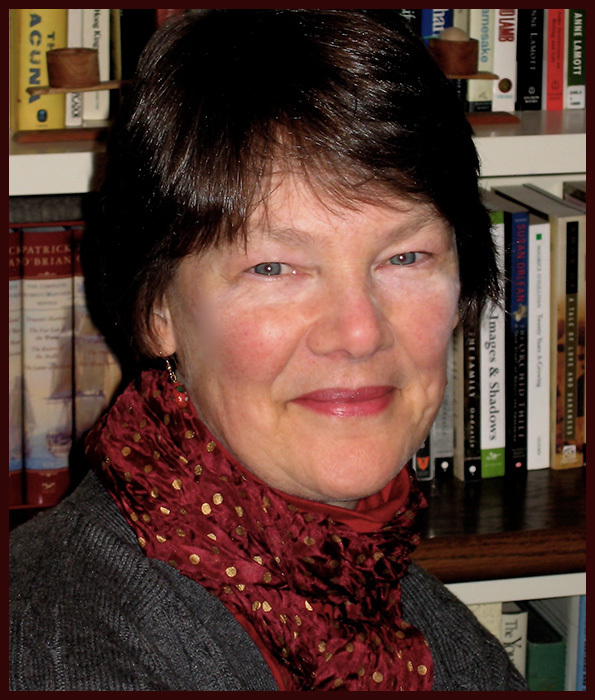 Joyce researches her subjects and includes factual information in her poems. Have students write their own insect poems. Include research about the insect and incorporate some facts into the poem. For an added challenge, write the poem in the voice of the insect. Use any of Joyce’s poetry ideas in your next poetry lesson. Explore a selection of Joyce’s books. Choose a variety of poems and show students how poems can take many forms. Discuss why Joyce might have chosen to write specific poems in a certain way (e.g., concrete, free verse, use of repetition, and so on). 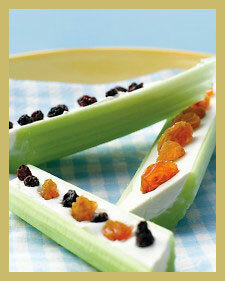 Make the classic ants on a log snack. Getting antsy? 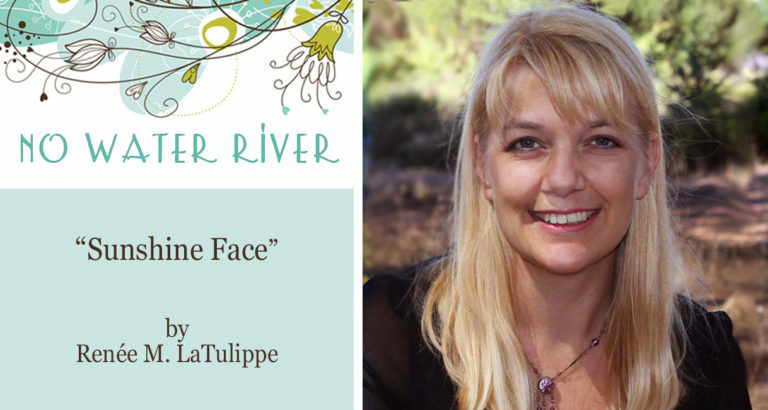 Laura Purdie Salas has today’s Poetry Friday roundup at Writing the World for Kids. All poems © Joyce Sidman. All illustrations © by respective illustrators. All rights reserved. Renee, your posts are always fabulous, but I am such a Joyce Sidman fan that this one gets a special place of favoriteness 🙂 Just incredible. It was such fun to see Joyce and hear her read one of her poems, and thank you for sharing all those book spreads… They’re all amazing and inspiring. Whenever I want to remind myself about the beauty and power of language in children’s books and inspire myself to write better, I re-read Red Sings From Treetops. Thank you, Susanna! Reading Joyce’s work this week was like a master class for me. Inspirational, a bit intimidating, and completely satisfying. There’s so much to enjoy and LEARN in these pages! Thank you, Renee for bringing us closer to Joyce. And thank you, Joyce, for your thoughtful and elegant responses. I loved your interview. The word “elegant” keeps coming up when speaking of Joyce and her work. I do think it’s the perfect word to describe her music/poems. Terrific interview, Renee! Thanks for letting us get to know Joyce better…it’s almost insightful to read what others do and how their process works. I especially like some of her more unusual poems (and unusual subjects) like, “Lichen We.” Great info for all of who write! I don’t have all of Joyce’s books, but some, & love Eureka, Poems About Inventors. 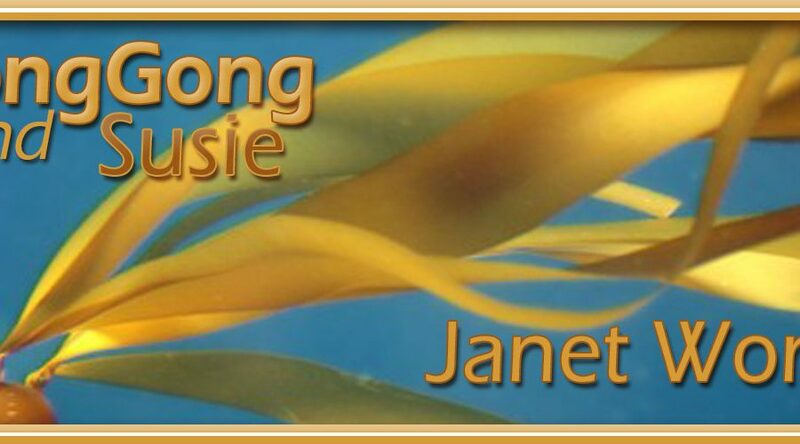 Thanks for sharing so many here, Renee and for the interview so we can learn more. It’s good to hear about the process of questioning and researching, filling up with the topic. My school places much emphasis on knowing one’s subject in order to communicate the excitement of it, and Joyce, your poems show that so well. I have used them often as examples of what students can do, with their topics and with poetry. Thanks for all! I didn’t expect to be so smitten with EUREKA!, but that first poem dragged me in. The last bit about running to the river and diving in just sticks with me. Love! Wow – so much to love and learn in this interview! These four words stopped me in my tracks: ” I am not prolific.” Perhaps not in the writing/drafting, but certainly in the preparation through reading, walking, discovering and exploring. Wonderful. Thank you Joyce and Renee! Those are actually my favorite four words in the interview because I’m the most un-prolific writer EVER. It’s nice to know someone like Joyce shares this trait/problem! Another wonderful post, Renee! I really love Joyce’s reading of her poem about ants. She is so natural in front of the camera. Listening to her read is like meditation–her demeanor is so calming. That’s the sense I get too, Janet. I watched some other videos on YouTube and was struck by Joyce’s naturalness — but then again, she is a teacher! 🙂 But I definitely felt that air of serenity. Watching the videos was like a little spa break. What a delightful interview. Red Sings and the Owl book are both stunners. I can’t wait to read Song of the Water Boat Man now. Thank you Joyce and Renee! I also wanted to include “Welcome to the Night” from DARK EMPEROR. I think you can see it on the Amazon preview – so wonderful! Another song! There’s so much to love about this post. I adore Joyce’s video – it’s special to hear a poet read their own poem aloud, and The Ants is rather cool! Red Sings from the Treetops was my first introduction to Joyce’s craft, and now I have so much more to explore. Great interview, as always, Renée! I thought you would like this poem, Joanna. But being the animal lover you are, you really should check out DARK EMPEROR. Stunning. Great poem and interview from a great poet! When are we going on the safari, Joyce? You would do us all a huge favor if you two could get on that right away, please! Renee, I was thrilled to read your wonderful interview with Joyce Sidman! When I helped kids from the Jemez pueblo in New Mexico with their reading, kids who come from a culture with no written language, Joyce’s book Dark Emperor was THE BOOK that got these kids excited about writing poems of their own. Thank you, Joyce! Wow, what a tribute to the book, Deborah! Thanks so much for sharing that! Thanks for this amazing interview, Renee and Joyce! Joyce already knows what a big fan I am of hers. And revisiting some of her poems here has inspired me to pull down ALL of her books and read them again. Joyce: you are brilliant and such an incredible inspiration to me. Thank you for being who you are! Holy smokes that was fantastic. I’m going back later tonight and re-read the whole interview again. RENEE AND JOYCE POWER!!!!!!!!!!!!!! Wonderful interview! I bought Dark Emperor for my grandson this Christmas and was sad to give it away. In my mind Joyce Sidman is to kids what Mary Oliver is to adults–a challenge to really see nature and adjust our frantic lives to its rhythms. Thanks Renee! That’s a great comparison! We just need to start saying it the other way around to those poetry-loving adults who don’t appreciate the wide range of children’s poems (and poets). I love your posts, Renee, because they always make me slow down, and this one was extra special. I liked reading the sampling of Joyce’s poems with the beautiful illustrations — Dark Emperor gave me chills! This is such a nice addition to your library and was a nice way to spend a bit of time on a Friday. Thanks! Thank you for the interview with this wonderful poet! Joyce Sidman is such an inspiration. A wonderful addition to your video library! Thank you both for such a thoughtful interview as well. Thank you for sharing Joyce and her work here today, Renée – her poetry is just stunning, and yet so playful and lively too. The safari project must happen! As for the poetry, I agree — facts and music and a sense of play in one elegant swirl. Joyce Sidman is an amazing poet and such a kind and gracious person! Joyce Sidman’s work has been such an inspiration to me–one of the first children’s poets whose work I fell in love with. Elegant is the perfect word for her work, and for Joyce, too. Though not in a stuffy, intimidating way. More in a thoughtful, kind, graceful, shock-you-with-wicked-humor kind of way:>) Yay, Joyce and Renee for this feature. Reading the work of people like Joyce, Amy LV, Janet, Rebecca Dotlich, YOU, and so many more has really made me think about the kind of poetry I want to write and has inspired me to WRITE BETTER. So thanks to you all! Lovely post! I have the book RED SINGS FROM TREETOPS and adore it. Thanks for introducing me to more of Joyce’s poetry, Renée. And thanks to Joyce for your poetry and informative interview. Aren’t they gorgeous books? Each one so rich, just like the poems. Hoo-boy. Any time I am feeling downhearted, I will reread these wonderful comments. Thank you all! Now, Renee, I think someone should interview YOU. How did you end up in Italy? What brought you to children’s poetry? Etc., etc. I, for one, would read THAT interview. Thank you for adding your voice to the library, Joyce! It has been a true pleasure meeting you and getting to know your work better. She’s amazing! Thanks for another great post.